Florescent lighting has been around for ages. It is one of the most commonly-utilized lighting techniques for businesses, offices, and basements alike. When setting up a lighting fixture, or if you’re looking to upgrade one that you currently have, you will have 3 options: T12, T8, or T5 bulbs. Knowing the key differences between them is crucial to choosing the best one that will be both cost and energy efficient. Choosing the right kind of florescent lighting is more than just saving money on an electric bill and finding a bulb that lasts the longest. When it comes to florescent lighting, it is important to choose the right one for environmental reasons as well. Florescent bulbs do contain traces of mercury and the best bulbs will have the lowest amount. Why are T12 bulbs still available if they were banned? Can I replace my T12 bulb with a T5 or T8? What are different light colors and why do they matter? When it comes to installing new florescent lights, it is important to choose the right ones in order to minimize the cost and maximize the efficiency. There are many notable differences between the three choices (T12, T8 & T5), but the key difference is how much energy they take to produce the most light (lumens). If ranked based on energy efficiency alone, the T12 falls woefully short compared to the T8 and T5 models. This is partially due to the fact that the T12 bulbs produce light via electromagnetic induction, while its counterparts produce light via electronic circuits. The lack of energy efficiency was so evident that the Department of Energy actually mandated that the production of T12 bulbs be limited after 2012. These lightbulbs are still available, but production has dropped over 50% since the mandate. When it comes to comparting T8 and T5 bulbs, many of the basics are similar. There are other main differences however, that will change which one is ‘best’, depending on the space you need the lightbulb to illuminate. To get started, here are some of the main differences between all 3 models and some of the similarities as well. T12 1.5" 20 - 75 watts 2 Electromagnetic Induction 20,000 Hours Check price! T8 1" 15 - 59 watts 4 Electronic Circuits 20,000 Hours Check price! T5 .625" 8 - 54 watts 2 Electronic Circuits 20,000 Hours Check price! It’s not unusual to want the most bang for your buck. When it comes to lighting, this is especially true. When it comes to florescent lights it is not too difficult to choose the best one. From the three available, there are two that tend to outrank the third in overall efficiency, availability, and aesthetic. However, depending on your needs and lighting capabilities, the best can still vary. One of the main features of a lightbulb is how well it can function on the lowest possible wattage. When looking at the three types of lighting, T12, T8 and T5, this is one of the key differences between them. T12 is the oldest of all lightbulbs and due to its electromagnetic induction design, tends to use the most wattage of all three bulbs. The lowest wattage available starts at 20 watts and it can go up to 75 watts per bulb. This is a step above the T8 bulbs which start at only 15 watts and can power up to 59 watts. Then, the little T5 comes in, able to run on only 8 watts and going up to 54. There is a notable difference between the T12 with 20 watts and the T5 with 8 watts. Additionally, the T5 uses nearly half the wattage of a standard T8 bulb. Overall, if you base this off of energy efficiency, the T5 is the best choice for your space. However, there are instances, when ranking efficiency along with lumens, that the T8 can sometimes be the better option. Lumens are the measure of light that comes from a bulb. It tells you how bright and strong the light is and is often set next to the wattage in a ratio-type measurement. Oftentimes, the stronger the lumens, the more wattage it requires. For the T12 bulb, this is most definitely the case. The lumen output is decent, but the wattage that is required to achieve a good, steady light is quite high. Enter the T8. This bulb runs on less wattage and as we saw above, it is more energy efficient. It holds a nice lumen output (3,000) without eating away at the electric bill. Between the T12 and the T8, latter is the better choice. Last but not least is the T5. It uses nearly half of the energy that the T8 does and actually has a higher lumen output (5,000). It would follow initially that this is naturally the best light for your space. However, T8 models do have a lower wattage per lumen. For areas that don’t need to be lit as brightly as others, or for spaces where a single, larger light is better than two smaller ones, the T8 will be the better of the two. Another feature that is good to keep in mind when searching for the best light is how the light is actually produced. In the case of the T12, T8 and T5, there are two different methods. For the T12, light is generated by via electromagnetic induction. This also requires different magnetic holders for the light. Nowadays, this is an older, less efficient method of creating light. For both the T8 and the T5, light is generated via electronic circuits. Between the two sets, the best option would be either the T5 or the T8. There is also a safer mercury count in both of these sets, compared to the higher levels found in T12 bulbs. A final feature to take into consideration when comparing the three types of bulbs is the available sizes and general aesthetic. Depending on your space, the available sizes may drive you to choose one as the best, regardless of energy efficiency or lumen power. The T12 bulbs are the largest, with available sizes ranging from 2-8 feet long. 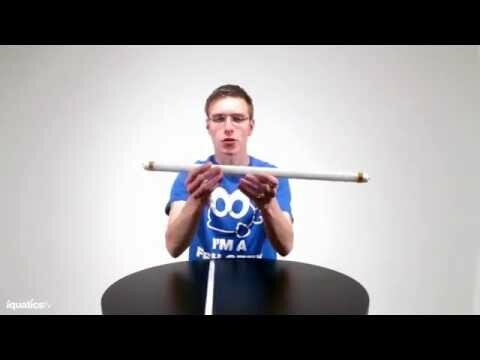 The diameter of the tubes are 2″ and they have come in both cool and warm white. T8 bulbs are 1″ in diameter and are smaller than T12, starting at 18 inches and going up to 8 feet in length. Between these two, the T8 is better for space efficiency. It is also the best of the three for lighting options, coming in warm, neutral, cool and very cool tones. The T5 is the smallest of all three. The diameter of each light tube is only .625 inches and the lengths range from 12-46 inches. This is 40% smaller than the T8 model. If you’re short on space, the T5 is the best bet. However, it only has two color options, which makes the T8 better when it comes to lighting variety. At the end of the day, the best lightbulb at the best price may not be the least expensive, but it will save you more money in the long run. It comes down to the T8 and the T5 models. While the T12 functions and is a contender when you’re looking to fill large spaces, it truly lacks the energy efficiency to be a good long-term investment. The T8 is the best option when it comes to spaces that don’t need strong lights (it has better wattage) and it has more color options for those who are more sensitive to lights. The T5 is the best if you need stronger, brighter lights and space is more confined. Before you purchase your next set of florescent lights, here are the answers to some of the more common questions asked. T12 bulbs were not banned in the United States. However, the Department of Energy ruled them to be the least efficient type of lighting that was being produced and worked to decrease the number of units produced. They are still widely available for purchase, due partly to the fact that not everyone can (or wants) to replace all of the fixtures and mountings in order to accommodate T8 or T5 bulbs. Unfortunately there are several factors preventing you from just switching out the bulbs if you want to convert one to the other. One of the main things preventing the interchanging of bulbs is the diameter differences. In addition to this, the lengths are not always consistent and the actual piece that generates the light is entirely different between the T12 and the other two models. If you are interested in converting your bulbs it is worth consulting with an electrician or asking for direction for self-installation at your local hardware store. The wattage measures how much energy is needed to keep things running. Your energy bill is based off of an amount x your wattage. The more wattage your lights use, the higher your bill is. It is important to purchase lights that produce the best light using the lowest wattage. This is one feature that can help keep your electric bill low. All three of the light bulbs produce white light. However, the range of white varies. The type of white is something that is very important to pair correctly with a space. Warmer, softer colors are better for indoors, while bright, glaring lights are best suited for garages, basements, and surgical operating rooms. Putting the right light in the right place will prevent eye strain and in some cases reduce or prevent headaches.